A: Asking a writer why they write is like asking a dog why they breathe . . . they don’t understand the question, but they’re still hoping you’ll toss them a bone. A: I write when I am sleeping, lying, eating, flirting, praying and pulling weeds. Living life is writing. It’s paper optional. N. M. is the author of A Travel Guide for Reckless Hearts out this month from Borealis Books. 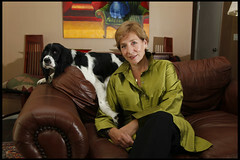 She is also the author of The Constant Art of Being a Writer: The Life, Art & Business of Fiction. She is working on the movie Whale Season with Dwight Yoakam!